Weight throw, 2002 Celtic Festival. Two sports have events that fall under the name of weight throw. One being the track and field event and the other being the Scottish highland games events. The track and field event is most popular in the United States as an indoor equivalent to the hammer throw event, which can only be held outdoors. The 35lb weight throw (men) and 20lb weight throw (women) are not recognized by the International Association of Athletics Federations. The Scottish Highland Games contain two weight throwing events. In the one event the weight, 28lb or 56lb, is thrown in a similar manner to a discus. In the other event, the 56lb weight gets thrown over a bar for height. The 56-pound weight throw was conducted twice at the Olympic Games, in 1904 and in 1920. Below is a list of vaults equal or superior to 24.78m. Lance Deal also threw 25.41 m (83 ft 4 1⁄4 in)i (1991), 24.82 m (81 ft 5 in)i (1993). A. G. Kruger also threw 24.99 m (81 ft 11 3⁄4 in)i A (2010), 24.78 m (81 ft 3 1⁄2 in)i (2007). Gwen Berry also threw 25.27 m (82 ft 10 3⁄4 in) (2018), 25.22 m (82 ft 8 3⁄4 in) (2017), 25.21 m (82 ft 8 1⁄2 in) (2017),24.85 m (81 ft 6 1⁄4 in) (2018), 24.77 m (81 ft 3 in) (2017), 24.70 m (81 ft 1⁄4 in) (2012), 24.69 m (81 ft 0 in) (2018), 24.51 m (80 ft 4 3⁄4 in) (2018), 24.45 m (80 ft 2 1⁄2 in) (2017), 24.39 m (80 ft 0 in) (2014), 24.51 m (80 ft 4 3⁄4 in) (2016), 23.93 m (78 ft 6 in) A (2018). Brittany Riley also threw 24.57 m (80 ft 7 1⁄4 in) (2007). Amber Campbell also threw 24.70 m (81 ft 1⁄4 in) (2010), 24.54 m (80 ft 6 in) (2007), 24.43 m (80 ft 1 3⁄4 in) (2009), 24.33 m (79 ft 9 3⁄4 in) (2016), 24.21 m (79 ft 5 in) (2011), 24.19 m (79 ft 4 1⁄4 in) (2010), 23.99 m (78 ft 8 1⁄4 in) (2005), 23.68 m (77 ft 8 1⁄4 in) (2008). DeAnna Price also threw 24.52 m (80 ft 5 1⁄4 in) (2019), 24.51 m (80 ft 4 3⁄4 in) (2018), 24.30 m (79 ft 8 1⁄2 in) A (2017), 24.20 m (79 ft 4 3⁄4 in) A (2018), 24.00 m (78 ft 8 3⁄4 in) A (2018), 24.09 m (79 ft 1⁄4 in) (2017), 23.90 m (78 ft 4 3⁄4 in) A (2018), 23.86 m (78 ft 3 1⁄4 in) (2017), 23.84 m (78 ft 2 1⁄2 in) (2017), 23.76 m (77 ft 11 1⁄4 in) (2017). Jeneva Stevens also threw 24.23 m (79 ft 5 3⁄4 in) A (2018), 24.22 m (79 ft 5 1⁄2 in) A (2018), 24.15 m (79 ft 2 3⁄4 in) (2018), 24.09 m (79 ft 1⁄4 in) (2018), 23.94 m (78 ft 6 1⁄2 in) (2013), 23.82 m (78 ft 1 3⁄4 in) (2014), 23.76 m (77 ft 11 1⁄4 in) (2012), 23.75 m (77 ft 11 in) (2016) 23.69 m (77 ft 8 1⁄2 in) (2015), 23.68 m (77 ft 8 1⁄4 in) (2013, 2014), 23.66 m (77 ft 7 1⁄4 in) A (2018), 23.65 m (77 ft 7 in) (2017). Janeah Stewart also threw 24.80 m (81 ft 4 1⁄4 in) (2019), 24.52 m (80 ft 5 1⁄4 in) (2019), 24.17 m (79 ft 3 1⁄2 in) (2019), 24.12 m (79 ft 1 1⁄2 in) (2018), 23.83 m (78 ft 2 in) (2018). Kaitlyn Long also threw 24.11 m (79 ft 1 in) (2019). Sade Olatoye also threw 23.84 m (78 ft 2 1⁄2 in) (2018). Ida Storm also threw 23.72 m (77 ft 9 3⁄4 in) (2018). Jessica Ramsey also threw 23.68 m (77 ft 8 1⁄4 in) (2017). The event, held outdoors and indoors, it is a World Championship and world record event in World Masters Athletics. Outdoors, it is also the final event of the Throws pentathlon. Masters athletics has different weight specifications for different age groups. The weight throw is an indoor track and field event, predominately in North America. The technique implemented to throw the weight is similar to that of the hammer throw in outdoor competition. In international competition, the men's weight is a 35 lb ball (25 for high school) with a D-ring or triangle handle attached directly to the weight. The technique in wide use is to start in a throwing circle with the thrower's back to the landing area. The weight is then swung overhead to gain momentum before transitioning into the spinning position. The thrower then turns heel to toe up to four times across the ring and toward the front of the circle. At the front of the circle, the thrower releases the weight over his/her shoulder and into the landing area. The landing area is a sector of 34.92° which is identical to the Hammer throw, Discus throw and Shot Put. Because of the demands of the landing area, USATF rules allow for the event as part of an indoor meet to be held outdoors. The world record for men is 25.41 m (outdoor) and 25.86 m (84'10") (indoor) and is held by American Lance Deal. For women, who throw a weight of 20 lb, the world record is 24.57 m (80'07½") (outdoor) set by Brittany Riley of Southern Illinois University on January 27, 2007 and 25.60 m (indoor), by Gwen Berry, on March 4, 2017. The weight throw event has had an enduring history in American track and field. It was a national championship event for men outdoors from 1878 to 1965. Despite the decline of such outdoor contests in the United States, the event has been a mainstay of the USA Indoor Track and Field Championships: the men's 35 lb event has been held from 1932 to present and a women's 20 lb weight throw event was introduced in 1991. The weight throw is also present on the event programme of the NCAA Men's and NCAA Women's Indoor Track and Field Championships. In the Highland Games, the weight throw consists of two separate events, the light weight and the heavy weight. In both cases, the implement consists of a steel or lead weight (usually spherical or cylindrical) attached by a short chain to a metal handle. The handle may be a d-ring, a triangle or a ring. The size of the weight depends on the class of the competition. For advanced male athletes, the light weight is 28 lb, or two stone (12.7 kg). The heavy weight is 56 lb, or four stone (25.4 kg). For all female athletes, the weights are 14 and 28 lb (6.35 and 12.7 kg). For male master class or senior athletes, the weights are 28 and 42 lb (12.7 and 19.05 kg). The weight is thrown one-handed from a rectangular (4.5 feet by 9 feet) area behind a toe board or trig. The athlete must stay behind the trig at all times during the throw. The techniques vary, but usually involve a turning or spinning motion to increase momentum before the release. Each athlete gets three attempts, with places determined by the best throw. 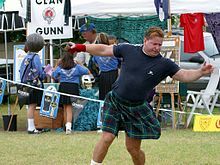 The weight over the bar, or weight throw for height, is contested at highland games in Scotland and elsewhere, and at track and field events in Ireland. The weight is thrown one-handed over a bar set at increasing heights above the thrower. Similar to the high jump or pole vault, the thrower has three attempts for each successive height. Places are determined by maximum height reached with the fewest misses. The size of the weight varies with the competition class. Advanced male athletes throw a 25 kg (56 lb. or four stone) weight, female athletes throw a 12 kg (28 lb.) weight and male master class or senior athletes throw a 19 kg (42 lb). weight. There are two techniques for this event. The classic technique swings the weight between the legs before pulling the weight up and directly overhead. The alternate technique (which is not allowed in some games) involves a spinning motion, with the athlete throwing from the side. In Ireland, a 56 lb weight is used for both height and distance weight throw events. ^ "All Time World Rankings - Weight Throw". mastersathletics.net. 13 January 2017. Retrieved 13 January 2017. ^ "NCAA Division I Championships 2001 Men's Results". www.flashresults.com. 2001-03-10. Retrieved 2011-02-05. ^ George Kochman (23 February 2019). "USATF Indoor Championships 2019: World-class athletes put on a show for Staten Island". silive.com. Retrieved 24 February 2019. ^ "Weight Throw Results". flashresults.com. 9 March 2019. Retrieved 10 March 2019. ^ "Merritt among Olympic stars to win in US". supersport.com. 6 March 2017. Retrieved 6 March 2017. ^ "Weight Throw Results". ncaa.com. 10 March 2018. Retrieved 11 March 2018. ^ "Weight Throw of 78-7 Sets World Best Mark". The New York Times. 26 February 1984. Retrieved 18 January 2017. ^ Jon Hendershott (5 March 2017). "Lyles clocks world indoor 300m best in Albuquerque". IAAF. Retrieved 5 March 2017. ^ "Vanderbilt's Music City Challenge 2019 Results" (PDF). cfpitiming.com. 9 February 2019. Retrieved 24 February 2019. ^ "Echikunwoke Throws Her Way to #2 All-Time in NCAA History". gobearcats.com. 16 February 2018. Retrieved 11 March 2018. ^ "Bloomington -IN- (United States), 25.1.2019 -Indiana Relays-- (indoor)". trackinsun.blogspot.de. 27 January 2019. Retrieved 1 February 2019. ^ "Weight Throw Results". 9 March 2019. Retrieved 10 March 2019. ^ "Weight Throw Results". timerhub.com. 24 February 2018. Retrieved 28 February 2018. ^ "Weight Throw Results". cfpitiming.com. 19 January 2018. Retrieved 20 January 2018. ^ "Weight Throw Results" (PDF). flashresults.com. 23 February 2019. Retrieved 24 February 2019. ^ "Fantastiskt kast av av Ida Storm – slog det svenska rekordet med över metern". friidrottaren.com (in Swedish). 15 February 2017. Retrieved 16 February 2017. ^ "Sultana Frizell improves Canadian weight throw record". Athletics Canada. 28 February 2017. Retrieved 4 March 2017. ^ "Wimbley and Okieme Shine at USATF Indoors". hurricanesports.com. 19 February 2018. Retrieved 20 February 2018. ^ "2019 KSU Steve Miller Open Results". tfrrs.org. 16 February 2019. Retrieved 24 February 2019. ^ "Weight Throw Results". tfrrs.org. 2 February 2019. Retrieved 10 February 2019. ^ USA Outdoor Track & Field Champions. USATF. Retrieved on 2012-08-23. ^ USA Indoor Track & Field Champions - Men's 35-lb. Weight Throw. USATF. Retrieved on 2012-08-23. ^ USA Indoor Track & Field Champions - Women's 20-lb. Weight Throw. USATF. Retrieved on 2012-08-23. ^ a b c "Competition Rule Book 2010 - 2012" (PDF). Athletics Ireland. 24 August 2011. pp. 12, 22, 33. Retrieved 24 March 2012. ^ a b "Men's Senior Outdoor Records". Athletics Ireland AAI. Retrieved 24 March 2012. This page was last edited on 10 March 2019, at 17:22 (UTC).